In the second half of 1980 IBM was in a hurry, searching for software for its new upcoming personal computer, what would become the original IBM PC. In July, they approached Microsoft and Bill Gates proposed that Microsoft will write the BASIC interpreter. When IBM's representatives mentioned that they needed an operating system also, Gates referred them to Digital Research (DRI), makers of the widely used CP/M operating system. The CP/M was by far the most popular operating system in use at the time, and IBM felt it needed namely CP/M in order to compete. So IBM's representatives visited DR and discussed licensing, but the parties didn't make an agreement. Initially Digital Research hesitated to sign IBM's non-disclosure agreement. The NDA was later accepted, but DR did not accept IBM's proposal of $250000 in exchange for as many copies as IBM could sell, insisting on the usual royalty-based plan. How did SCP come to QDOS? In the beginning of 1980 SCP wanted to offer its board with the 8086-version of CP/M that Digital Research had announced, but its release date was uncertain, that's why SCP decided to make its own operationg system, assigning in April 1980 the task to the engineer Tim Paterson, a young graduate from Seattle's University of Washington. 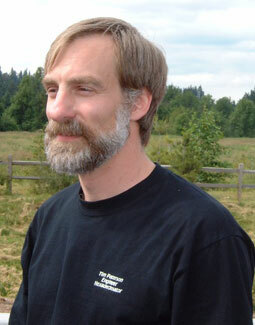 Tim Paterson (born June 1, 1956) studied electrical enginneering at University of Washington and in late 1976 he got a job as a technician at a Seattle-area retail computer store, where he started toying around with designing his own peripheral boards for computers. The store was selling the boards of SCP and in 1977 the manager of SCP asked Tim to consult for the company. In June 1978, after getting his bachelor of science degree , Tim became a salaried employee of Seattle Computer. At Seattle Computer Tim at first worked on redesigning a memory board, and then on a 8086 CPU card. Once the prototype of the 8086 CPU card was up and running, SCP was approached by Digital Research to see if it could get CP/M to run on it. Microsoft wanted to see if some of its programs would work, too. At the end of May 1979, Paterson went to Microsoft and a week or so, he cranked out all 32K of Microsoft's Basic onto the 8086 card. In April 1980, Paterson began work on an operating system for SCP's 8086 card. He recalled: "Step one was to write down what CP/M-80 did. Step two was to design a file system that was fast and efficient." By July, Paterson had finished some 50 percent of the operating system and called it QDOS 0.10 (for quick and dirty). He quickly found a bug, so it became QDOS 0.11. By the end of August 1980, QDOS 0.11 worked fine and was being shipped as a complete operating system, including an assembler, resident in the operating system, debugger, and a simple line editor. In the late 1980 QDOS was renamed to 86-DOS and in December SCP came out with 86-DOS, 0.33, which had significant improvements over QDOS. In May 1981 Paterson left SCP and went to Microsoft to work full-time on the PC-DOS version of 86-DOS. He finished PC-DOS in July, one month before the IBM PC was officially announced to the world. By this time, 86-DOS had become MS-DOS.